From the nation's second oldest amusement park to the victorian village on Put In Bay, Sandusky, OH. is full of old fashioned fun for the whole family. From the moment the boys learned that we would be visiting Cedar Point, the "roller coaster capital of the world," they were stoked. We visited Sandusky recently as part of our #90DayRoadTrip, and the area didn't disappoint. For three days we enjoyed nonstop fun and thrills. By far, our favorite part of our visit to Sandusky, OH. was our trip to Cedar Point. We stayed the night before at Cedar Point's hotel Breakers, which has just recently undergone a multi-million dollar renovation. The decor and location of the hotel had us raring to go to the amusement park the next day, so we got up bright and early and headed to the park when it opened. Cedar Point features over 70 rides, 17 of which are roller coasters! How incredible is that? Now, if you are not all about the thrill rides like myself, fear not, there are plenty of options available no matter what your adrenaline level might be. There were even some coasters like The Cedar Creek Mine Ride and the Iron Dragon that were tame enough for even me. There are plenty of other types of rides sprinkled throughout this iconic park as well. My two youngest loved the Antique Cars. Children can enjoy driving cars around the track, under covered bridges and through the course. I love rides like this that are a throwback to the park's opening days in 1870. There are other fan favorite rides including bumper cars, the Himalayan, the Giant Wheel and water rides like the Thunder Canyon and Snake River Falls too. If you are traveling with little ones, Camp Snoopy and Planet Snoopy have you covered with kiddie rides, including the beautiful carousel. Meet and greets with Snoopy and friends are available in these areas at different times as well. Want to take it slow for a while? Stop by barnyard to pet goats, cows, miniature horses and other furry friends. You can purchase food to feed the animals, but they will let you pet them without it too. Don't forget to take in a show or two during your visit to Cedar Point too. We were only able to take in one during our day of fun there, but it was a great one. Lusty Lil's show is full of laughs and good old fashioned fun for the family. Of course, for those who are brave enough, there are more than enough thrill rides to keep you busy all day. The boys tried their first flipping coaster, the Corkscrew during our visit. After that, they were game for many more coasters and went on the Mean Streak and Gemini to name a few. There were a few rides that we were not quite brave enough to try, but hope to work up to on a future visit, like the incredible Top Thrill Dragster and Rougarou. For hours and admission information, visit CedarPoint.com. Next up on our adventure in old fashioned fun in Sandusky, OH. was a visit to Put in Bay. We took a Jet Express ride out to this island located in Lake Erie. Our Jet Express ride was another highlight of our trip to the area, and I can't imagine a better way to travel to the islands. These boats are thrilling and relaxing all mixed into one. With locations in Port Clinton and Sandusky, you can leave to travel to both Kelley's Island and Put in Bay at different departure and return times throughout the day. 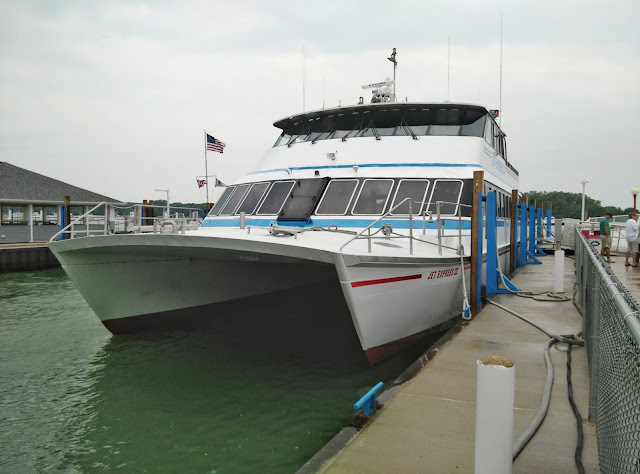 The boats travel at a speed of up to 30 mph across the water, and there is an upstairs open air deck that is the perfect place to sight see in good weather, and a temperature controlled sitting area downstairs with comfortable seating which we took advantage of during our rather rainy visit on the way to Put in Bay. For information on ticket prices and current schedules, visit Jet-Express.com. A visit to Put in Bay is like stepping back in time with its "island life" mentality and historic Victorian inspired homes located throughout the island. This two by four mile island is one of the most popular of the Bass Islands. People flock to Put in Bay in late Spring and throughout the Summer for fun in the sun. There are a wide range of family attractions located on Put in Bay, many of which do not cost a dime. Check out the third tallest monument in the country, the 352-ft Perry Peace Memorial. This memorial was built to honor Master Commandant Oliver Hazard Perry, one of the biggest victors of the War of 1812. The monument was constructed 100 years later in 1912 in his honor. It is free to visit, and $3 a person to go to the top. Getting around Put in Bay is easy with a golf cart rental. While many areas can easily be reached by foot, a gold cart definitely comes in handy when you want to explore some of the areas and homes that are further out on the ends of the island. 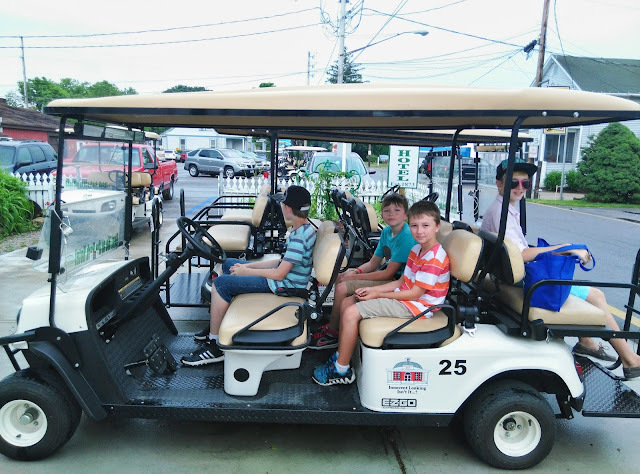 We had a golf cart rental from Park Hotel and it was a saving grace as the boys wanted to explore every inch of the island, and it was raining off and on during the day we were there. 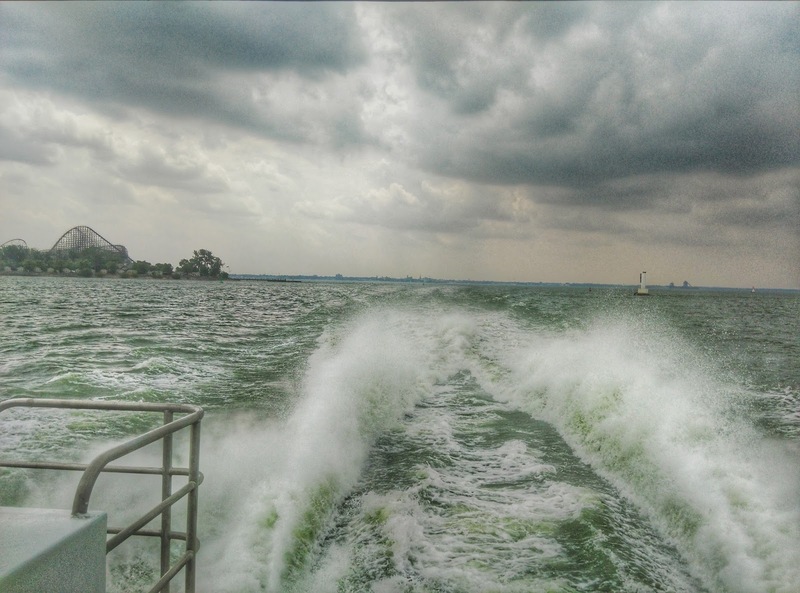 Want to learn a little more about the Lake Erie Islands? Stop by the Lake Erie Islands Historical Society Museum. See models of the greatest ships to sail in Lake Erie, learn about the wine-making industry of the area and the island geneology in this three building museum. Admission is $2 per person. Some of the best Walleye fishing in the area can be had at Put in Bay. One of the best places to fish in this area is at South Bass Island State Park. Camping, a playground and kayak/canoe rentals are available here as well, and admission is free. Fish lovers will enjoy the island's Historic Fish Hatchery and Aquatic Education Center too. One of our favorite activities on the island was driving around in our rented golf cart to explore and look at some of the island's historic homes like Luckystone Manor circa 1840, and Stonehenge Estate. Other family favorites on the island include a visit to The Chocolate Museum, Perry's Cave, the Antique Car Museum and a ride on the Island Tour Train. Another free activity for families is to relax and enjoy DeRivera Park with it's playground and historical displays. To plan your visit to Put in Bay, visit VisitPutinBay.com. While old fashioned fun is awesome, sometimes it is great to add in some modern thrills as well. There is no better place to do that in Sandusky than at Ghostly Manor Thrill Center. This family friendly attraction is primarily known for its haunted house, which is voted one of the top 10 in the country, but it has so much more to offer. In addition to its incredible haunted house, there is a blacklight skating rink, where you can use traditional skates, inline skates or scooters. This was a great change for the boys, and they all enjoyed being able to use scooters on the skate floor. The Wizards Journey miniature golf course was another surprise. Embark on a journey to free the wizard with your family on this black light 3d course. Don your 3d glasses and take this challenging journey to see who comes out the victor. The XD theater offers a wide range of adventure rides, including the fastest simulated coaster around. Sit in your full-action seats and buckle up for a wild virtual ride. Children 12 and under will enjoy the bounce houses and playground area at the Ghostly Manor Thrill Center. This is a great option for the little ones who might be too scared to do some of the other activities, making Ghostly Manor a great night of fun for the whole family. For pricing information including discounted passes for multiple attractions, visit GhostlyManor.com. To start planning your vacation to Sandusky or the surrounding area, visit Lake Erie Shores and Islands today.